Home » World » USA & Canada » Train Derails in New York, 4 Killed! A passenger train has derailed in north of New York City injuring 63 passengers and killing 4 people. Authorities have confirmed the death toll. The Fire Department of New York (FDNY) have said that they have deployed 135 firefighters who are working tirelessly on the scene of the derailment to help rescue the injured. 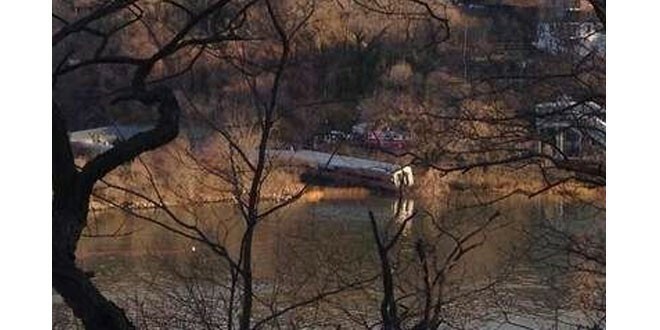 The train derailment happened close to Spuyten Duyvil station in the Bronx. Emergency services were “assisting with rescue and treatment of patients” at the scene of the accident. Eleven of those injured are said to be in a critical condition, with another six in a serious condition, according to the FDNY. The accident took place at 7.20am on the Poughkeepsie to Grand Central Station Metro-North train around 100 yards north of the station. The Metropolitan Transport Authority (MTA) said four or five carriages on the seven-carriage diesel train had derailed on a curved section of track, but none entered the adjacent Hudson or Harlem rivers. Spokeswoman Marjorie Anders confirmed there were fatalities and said the accident occurred in a slow speed area. She added the train black box would reveal how fast the train was travelling. New York Governor Andrew Cuomo said four people had been killed and 63 injured. Among the injured was the train operator. He added that authorities believe everyone at the site has been accounted for and that the National Transportation Safety Board was on the way to carry out an investigation. Witness Edwin Valero was in an apartment building above the scene when the train derailed. He said at least one carriage stopped just feet from the edge of the water. Initial reports had suggested some of the carriages may have been submerged. Footage of the crash scene showed divers in the water, with reports that two passengers were thrown clear of the train. Joel Zaritsky woke up as his carriage rolled off the track. He said: “I was asleep and I woke up when the car started rolling several times. Then I saw the gravel coming at me, and I heard people screaming. He added that passengers were taken off the train, with dozens bloodied and scratched and holding ice packs to their heads. Juneteenth day : A history which must be remembered! Last of Hostess Twinkies Sold for $60! Next: The Hunger Games: Catching Fire Retains Top Spot for Second Week on Box Office! Kendall Jenner & Harry Styles Dating?